Mihama American Village in Okinawa, Japan. The reason of Abe’s frustration with Onaga is clear. Onaga, formerly a member of ruling Liberal Democratic Party (LDP) who used to support Futenma’s relocation to Henoko when he was the mayor of Naha City, has not softened his stance against the existing plan to relocate Futenma Air Station. Onaga even visited Hawaii and Washington D.C. between May 27 and June 5, accompanied by a delegation of Diet and prefectural assembly members from Okinawa, to voice the prefecture’s opposition to the current government plan to U.S. lawmakers and government officials. If anything, the cool treatment he received in the United States — he could not get any official whom he met during his trip to sympathize with his position — seems to have hardened his opposition to the current plan. To be fair, the problem associated with the relocation of Futenma Air Station is not of Abe’s making. 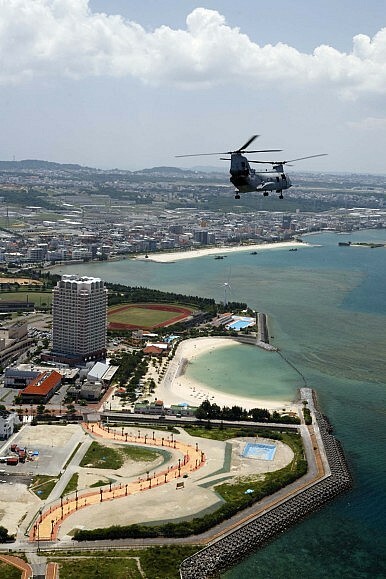 In 2009, Yukio Hatoyama, then the prime minister and head of the Democratic Party of Japan, promised that his government would look for an alternative to the current relocation plan that is “at minimum outside Okinawa.” With that promise, a sense of hope quickly emerged and spread in Okinawa that the Futenma relocation issue could be resolved under the new political leadership. When Hatoyama admitted nine months into his premiership that he had come to realize that the existing plan was indeed the best option available for Okinawa, disenchanted political leaders in Okinawa (who lost whatever little confidence they may have had in Japan’s central government) came together behind the banner of “no new construction in Henoko.” In other words, five years after Hatoyama left office, the Abe government still struggles to recover from the situation aggravated during the Hatoyama administration. Still, the reality remains that the relocation of Futenma Air Station has not been achieved almost 20 years after the U.S. and Japanese governments first agreed on it in 1996. The local government holds a great deal of authority in issuing various permits required for the construction of the replacement facility to proceed. Therefore, even if Onaga cannot stop the construction in Henoko, he can still make the process as difficult as possible for the Japanese government. Theoretically, Abe can counter these moves by trying to enact a Special Measures Law that would allow the central government in Tokyo to proceed with the relocation without having to subject the process to the approval by the governor and/or mayor, essentially overriding their authority. There is precedent for this — in 1996, the Japanese government revised the Special Measures Law to practically allow the Japanese government to continue to rent the land for U.S. military bases and other facilities from private landowners regardless of the owners’ request for the land to be returned. However, doing so prematurely would damage the Abe government as it has the risk of triggering anti-U.S. base sentiment across Japan. The approval rating for Abe’s cabinet is on the decline since the government hit a major speed bump in its deliberation of national security legislation after three constitutional scholars unanimously argued that the proposed legislation is “unconstitutional.” Under the circumstances, Abe will not want to force the issue. The current situation, where Futenma Air Station’s ultimate fate remains in limbo, is unsustainable. As Tokyo’s relationship with Okinawa remains deadlocked with no real prospect of a breakthrough, Futenma remains, as it was 20 years ago, one of the most tangible vulnerabilities for the political sustainability of a U.S. military presence in Japan, and the U.S.-Japan alliance writ large.